Jenn and Romy: Romy Got Fivefingers! Romy's new Vibram fivefingers shoes. 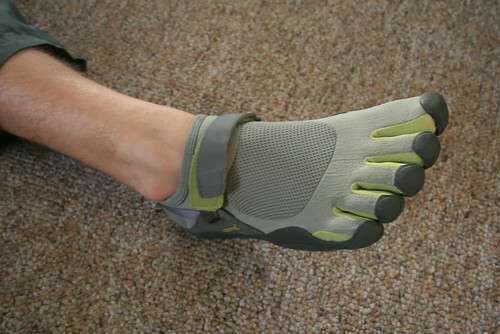 Today, Romy got a pair of the new and weird Vibram Fivefingers shoes. We got our REI dividend in the mail and a 20% off coupon, so we went to REI to get some kayaking stuff. We were looking for pfds (personal flotation device aka life vests) and kayaking shoes. While looking at the kayaking shoes, I got the idea about the Fivefinger shoes. We both heard of them before and saw a few people wearing them, and we've also heard that the people who are into walking barefoot really like the fivefinger shoes. So since the kayaking shoes were almost the same price, we checked out the fivefingers, which we could use as kayaking shoes and 'normal' shoes for walking, hiking, running, etc. The fiverfingers are light and breathable so you can wear them without socks and your feet don't get sweaty. We both tried on a pair, which had to be specially fitted. They went by European size, not the typical American sizes, because European sizing is more specific. I had a size 38/39 and Romy had a size 41. When Romy tried his on, he instantly liked them. I thought they were cool, but the pinky toe space for my foot didn't fit right. The shoe was pulling my pinky toe away from my other toes in a way which wasn't too comfortable. So I decided against getting them, but Romy really loved them so he bought a pair. I just went back to the kayaking section of the store and got a pair of NRS kayaking shoes, which are like a wet suit that goes around your feet but has a hard rubber bottom (still flexible though). 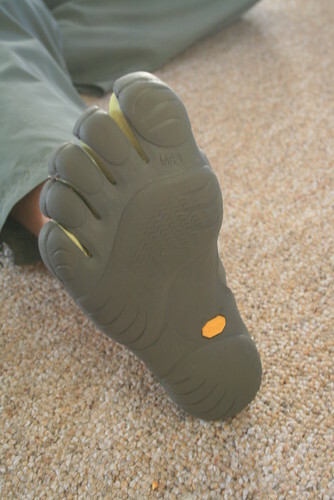 The sole on the fivefingers is pretty thick yet flexible. So I guess we will see how Romy likes them, as he gets used to walking in them. 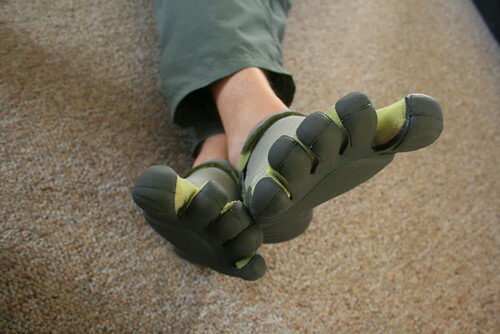 I think they are really cool, especially for people who love going barefoot or in sandals all the time. Update (4/10/2010): Romy wore the fivefingers to Death Valley, and went hiking with them. He said they were very comfortable. However, sometimes he got small rocks stuck between his toes when walking on gravel. Not a big deal though. It happened twice. A funny story - we got our car (the Daewoo) stuck on some gravel. Romy basically tried to drive over a pile of gravel and sand to get to an off road section of the road where we could camp. The pile was slightly too high though, and the wheels got over it, but then we bottom-ed out. The chassis dragged on the ground, and two of the wheels lost grip with the ground so we were stuck. We had to dig the excess gravel out from under the chassis, so we started digging. We got to a point where we had almost all of the gravel out from under it, but it was still resting on top of a small strip of gravel which was hard to dig out because it was so far under the car. Romy used his foot with the fivefinger shoes on to dig the rest of the gravel out, as if it was another hand or shovel. He said that because he was able to curl his toes, he was able to dig better with his feet. The shoes weren't damaged at all, which is awesome because he was doing some serious digging! We ended up getting the car out shortly after that. Update (4/17/2010): Romy wore the fivefingers kayaking. He said they were good for walking around in the water when entering and exiting the kayak, and kept his feet warm even though they were wet. I like your toe-splaying photo! Going to pick this up at the five fingers fan site (birthdayshoes) Sunday in the weekend link love! Hope you're enjoying your new found foot freedom.